Hey son, it’s after 3:00 AM. Wake up. Let’s get going. We don’t want to be late. I heard him start to gather his gear in the darkened tent. Most people picture the wilderness as a place to get away. Solitude. Communing with nature. They don’t think of it as a place where it’s impossible to get a good night’s sleep because of the 24 hour party. Welcome to the Timpooneke trail to Mt Timpanogos. We had selected what seemed to be a somewhat out of the way campsite. We were off the main trail about 200 yards. Unfortunately, the thin mountain air, and the surrounding granite walls meant that sound travelled incredibly well. Other campers, some as far as a quarter mile away, were less interested in a good night’s sleep and an early start. I woke up at 3:05 without the need of an alarm. Of course, I had also woken up at 12:30, 1:45 and 2:15 thanks to our raucous neighbors. I work in a call center. Our agents start their first shift at 5:30 AM. As I struggled into my clothes in the dark of the tent, I thought about the fact that some agents got up at this time every morning. It made me grateful for my job. I can pretty much show up whenever I choose to in the morning. I work in Salt Lake City and live 40 miles south in Pleasant Grove. It’s 90% freeway driving, but 50% of that Freeway is being renovated. I choose to start the 45 minute drive to work around 5:45 most days. It beats the traffic. Our hike had similar logistics. Mt Timpanogos is the most climbed peak in Utah. Those members of our group who had done the hike before warned us to expect a lot of people. Pretty much the trail stays busy all night long. 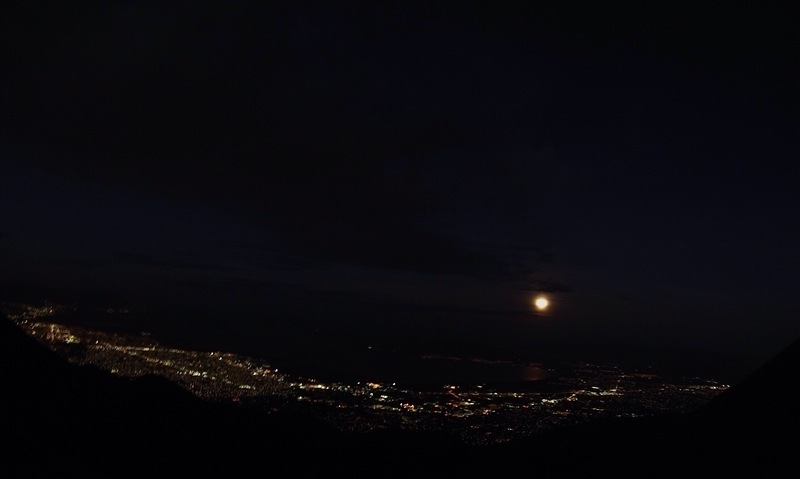 Our hike was the night of the epic moon. It was huge in the sky. As soon as we hit the trail the moon was masked by the trees and canyon walls. Each of us was walking in a tiny glow of our own headlamp. At times we could look up and see the headlamps of previous hikers marking the trail like a string of Christmas lights in the darkness. After my misadventures of the previous day (How I Got Lost For The First Time) my son opted to hike with me. I’m a slow hiker. My knees are about 20 years older than I am. Even in the best of times they pop and creak. We’d hiked four miles the previous day. Today was 16 miles; seven to get to the top and 9 to get back to the parking lot. Our group leader was worried about me. He wasn’t the only one. Rodney, how you holding up? You go ahead. I’ll make it. But, if I don’t, pick me up on the way down. Ibuprofen was my friend; breakfast of champions. Eventually, our group got spread out on the trail. My son and I were hiking with another dad and his son. None of us were setting any speed records. My son, I’m sure could have. When he was 12, we went on a scout hike that involved about 8,000 feet of vertical rise and fall. My son, is short, and his pack was big. The scoutmaster and I hiked at the back with my son right in front of us. It was hours on the trail. My knees protested and we limped along, the scoutmaster refusing to leave us. Eventually, we dragged into the springs were we were having dinner. The scoutmaster pulled me aside. Rodney, I have to say, I’m impressed with your boy. I’ve done this hike every year. There’s always that scout who is slow. But, normally about half way to the springs they want to give up. Your son kept going and never once asked us to carry his gear. Yeah, he’s kind of like that. He spent this last summer building trails in the LaSal mountains of southern Utah. When we went to pick him up his crew chief commented that he was one of the hardest workers on the crew. . .and the fastest up the trail. He certainly didn’t have to slow his pace to hike with me. I have to admit, I was glad he did. The milies crawled by. As we climbed we eventually caught sight of the cities in the valley below. The trail became more agressive and our rests became more frequent. The other boy in our group was really laboring. His father was trying the find various ways to encourage him and keep him going. The clock was not our friend. The three AM start time was designed to get us to the peak just before sunrise. We had been well off the pace from the beginning. Finally, the other dad made a decision. You guys go on ahead. We’re not going to make the summit, but we don’t want to slow you down. If the kid was hiking slower than me, he was really doing poorly. The ibeprofen had kicked in and my knees were not complaining at the moment. My son and I pushed on. Or rather, I pushed, he pulled me. Not physcially, but he set a pace just fast enough to pull me along. Other than the lights snaking up the mountain, it was impossible to see anything. I thought how much harder it is to pursue a goal you can’t see. It was 7 miles from our camp to the peak. How far is seven miles? 36,960 feet. But, in the darkness, it was endless. One foot in front of the other. Stumble over a rock. Recover. Next step. One foot at a time. And then, off to our left we noticed a change. It was subtle at first, just a hint of slightly fewer stars. But, eventually, we recognized that dawn was approaching. I still had no idea how far we were from the summit. And I had no idea if my knees, which had started aching again, were up to the miles of trail and hundreds of vertical feet we still had to go.